Fast food contains hidden sugar in order to make it taste good. The worst offenders are dipping sauces and fizzy drinks, but it’s in almost everything, even the ‘healthy’ options. Sometimes these are even worse, since to replace the missing fat, the manufacturers add extra sugar to compensate. Eating fast food while you are out and about leaves debris on the teeth. This allows acid to build up underneath, causing cavities and decay. As well as containing huge amounts of sugar, soft drinks are also highly acidic. The corrosive effect this acid has on tooth enamel is like acid rain in your mouth. Diet pop omits the sugar, but is just as acidic. Excessive consumption of fast food is a major cause of diabetes, which in turn has a negative effect on gum health. The simplest thing you can do is eat less fast food! Even one less visit to McDonald’s a week will give your teeth some respite. 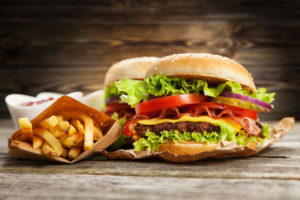 However, when you do decide to eat fast food, there are some steps you can take to minimize the impact. Try and pick options with no sugar. Skip the dipping sauce and order a salad without dressing. Order a coffee with no sugar, or just water. Unless you are on a special diet, try to prioritize low sugar over low fat. There is growing evidence that sugar, not fat, is the main cause of obesity, so it’s really a win-win. Chicken nuggets and fries usually contain no sugar (if you don’t have them with sauce). After you eat, wait thirty minutes then brush your teeth and floss. If that’s not possible, chew sugar-free gum. At least, try to rinse the food off your teeth with water. Of course, the only way to ensure good oral health is to have regular checkups. For dentistry with a smile, that will give you the smile you want, call us today or fill out the contact form.